Too many kids in show business are not in it by their own choice, but, like Judy Garland, are pushed into it by their parents, usually in the form of the notorious stage mother. 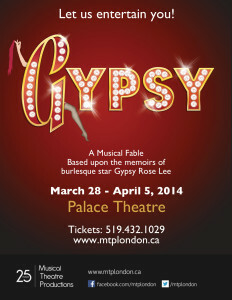 This play is a classic illustration of that through the life of Gypsy Rose Lee, the stripper who grew up under her domineering mother until she finally found the strength to go their own paths. In the 1920s, Rose (Angela Southern), an aspiring stage mother, gets her daughters, June (Kathleen Watkins) and Louise (Sarah E. Abbott Carter), into vaudeville for a life she never had. Through a combination of moxy and bullheaded aggressiveness, Rose makes the most of their act’s one song to get an agent and supporting players for a show that goes up the ranks of the vaudeville circuits. However, changing times and her daughters growing up lead the act’s decline with vaudeville and June’s alienated escape, leaving Louise to be Rose’s pawn for reflected glory. When the act is forced to go into burlesque theatre to survive, Louise finally gets her own chance to shine as the greatest of the strippers for a life that her mother has no meaningful part of. It’s interesting how a title can be so benignly misleading; this play is really about the life of Mama Rose, the archetypal stage mother, who is so desperate to make her daughters stars that nothing is going to stop her. However, there is a tragic undertone that sells the story even better as Rose refuses to change with the time or respect her maturing children’s wishes. While I wish there could have been more development of Louise growing more comfortable and confident with the stripper act, it does make for a striking contrast with Rose’s falling status until there is that final tragic fantasy to cap it off. To make such a story work, Angela Southern does the legacy of Ethel Merman proud with a brashly confident performance as Rose, getting her single-minded determination and her tragic fall down perfectly. Against her, Abbott Carter’s more pliant personality shines as a woman who has gotten out of her mother’s grip by seizing on a form of theatre that seems a slap in the face of her mother’s pretensions. Thus when Louise finds her calling, it is more than a job, it’s a risque declaration of independence. Between that battle of wills lies the heart of the story. Meanwhile, Watkins shines in her own way as the first pawn of her mother’s theatrical ambitions. It’s both saddening and triumphant how she was forced to hide her age for her mother’s selfish ego and how she finally broke free. The rest of the cast is equal in their own roles, but the standout is Cole Hill as Tulsa for his appealing performance and impressive dancing. Seeing him developing his act, Hill neatly epitomizes how Mama Rose’s company is growing away from her hackwork to create lives of their own and presents a warning she ignores to her own sorrow. The music is of course stellar, and with an edge that you would never expect. For instance, the classic Everything’s Coming Up Roses has a dark element with June having just escaped, and Louise has to suffer her mother’s self-centred ambitions and she knows it. That said, the others songs, like the equally famous Together, Wherever We Go have that lighthearted magic that made the play a classic. The stagecraft truly honours this classic story with careful artifice that suggests lavishness on an economical budget. The family’s act and the final number feel like the best of Broadway without overdoing it. For instance, Mama Rose’s act is a cheap idea with the equally cheap costumes you would expect for low end vaudeville and the aesthetic effect is as convincing as it is funny. However, when the show has to be gaudy and obvious, like the veteran burlesque strippers, the play shows its money’s worth for maximum comedic value. Broadway plays before the 1970s often have the feel of being flowery and insubstantial, but this one has a heart that, along with Oklahoma! , can lead one to reassess the real artistry of that that time.